Hyderabad: One of the key takeaways of the Telangana Assembly elections is the remarkable transformation of the "friendship" between the TRS chief K Chandrasekhar Rao and AIMIM President Asaduddin Owaisi into a "full-fledged partnership." All India Majlis-e-Ittehadul Muslimeen (AIMIM) fielded eight candidates in the December 7 polls to the 119-member house and supported the TRS, where the two describe themselves as friendly parties, in the remaining segments. And, Asaduddin Owaisi, the Hyderabad Lok Sabha member, campaigned for the TRS candidates in some constituencies, bringing the two parties even closer. In the election results, AIMIM won seven seats, while the TRS seized 88. KCR and Owaisi are on the same page as far as bringing together regional parties and promoting a non-BJP, and the non-Congress federal front is concerned. Both have been wholesome in praising each other. "Asaduddin Owaisi is a very good intellectual of this country," KCR has said, citing his participation in debates in the Lok Sabha and on television. "He (Owaisi) is not a fundamentalist, he is a secular political leader. He is with me. We will go together across the country (for the cause of bringing regional parties together), and we will work together," the TRS chief said. Owaisi, for his part, never misses an opportunity to return the compliments. "I hope KCR realises that he should not now limit himself to Telangana only...he has a very large national role to play, and I am sure that with the governance model he gave in Telangana, he will definitely do wonders," he said after the TRS returned to power with a thumping majority. "KCR has to come forward, and we welcome his announcement. We will tell the people of India. There is a need for non-Congress and non-BJP leaders to come together to give a new vision, new economic policy...KCR has the capacity," Owaisi said. 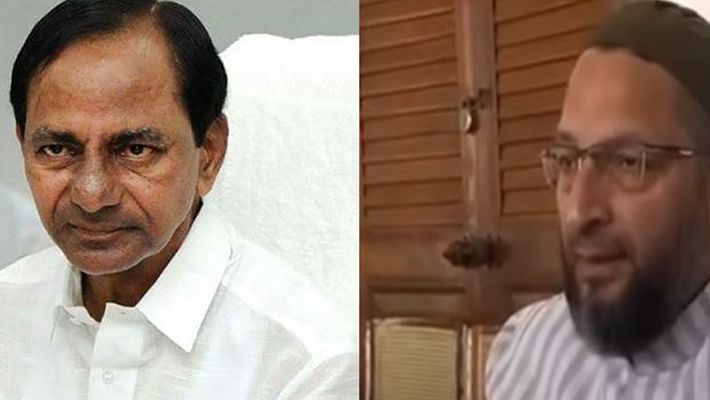 He said he was "pretty much sure" that KCR would be able to galvanise all non-Congress and non-BJP parties and that he would play a crucial role in bringing a non-Congress and non-BJP government to power. #Semifinals18: BJP or AIMIM: Who will be the kingmaker in Telangana elections?